A street illuminated with white light (LED lamps) and another one with sodium yellow light (High Pressure Sodium or HPS lamps). Pedestrians feel safer in streets illuminated with white light than in those illuminated with yellowish lights (technically called 'sodium-yellow'), even when the former are more polluting in certain aspects. One of the possible reasons is that this kind of light allows a better identification of human faces. Those are the conclusions of multidisciplinary research carried out by scientists from the University of Granada (UGR) belonging to the departments of Civil Engineering and Social Psychology. The researchers analysed, among other variables, the pedestrians' perceived safety and well-being when walking by streets with particular illuminance types and levels. 275 pedestrians from Granada participated in this research. They were given a test just after walking by the streets when public lighting was on, so that their answers were not conditioned by their memories or by other perceptions not related with the study. In addition, this work suggests that lights with high content of blue wavelengths (such as some of the white lights in public lighting) a greater inhibition of melatonin, the so called 'sleep hormone', something already observed in laboratory studies by teams of researchers all over the world. For the first time, this has been proven for public lighting in real transit conditions, based in the subjective answers given by the pedestrians. However, the authors of this work warn us that the quantification of physiological parameters such as melatonin inhibition or cortisol secretion, both greatly related to illuminance, "is a subject that should be studied by other type of specialists, and in any case is the aim of this research, which is centred on the pedestrians' perception and its correlation with the lighting installations quantitative parameters". The results of the inquiry were crossed with quantitative measurements of the main parameters involved in public lighting. The analysis of the group of data and their interactions has proven some of the hypothesis that, to this day, had only been proven in laboratories and under strict experimental conditions, while this research has been centred in real conditions. Among other results, the researchers have assessed that the pedestrians' reactivity to all kinds of subjective matters, in each and every case, increases with the increase in illumninance levels. 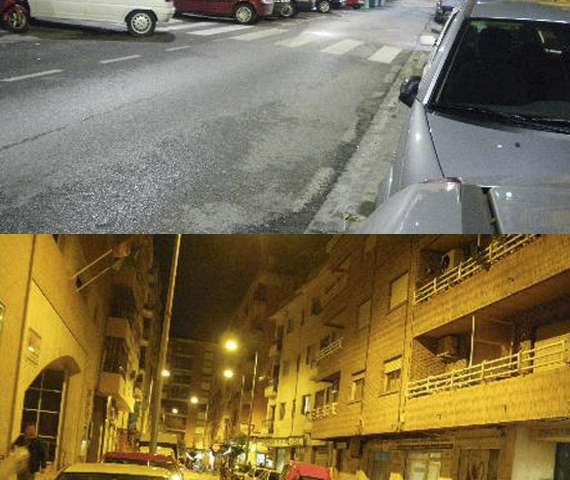 "The results, although obvious in some of the questions of the inquiry, in others were more paradoxical and should call our attention about the elaboration of new regulations on public lighting", Antonio Manuel Peña García, professor at the department of Civil Engineering at the UGR and lead author of this work, explains. To this day, most studies about public lighting, both academic and professional, have been centred on objective and quantitative aspects, that is to say, the design of more economic and efficient installations, compliance with applicable regulations, new technologies, etc. From another, less technical perspective, the effects of the illuminance on personal and material safety have been assessed, too. That's the main aim of lighting technology. "In this regard, controversy between different authors and philosophies about urban lighting has been such that, to this day, there's no unanimous agreement on if higher illuminance levels increase street safety or, on the contrary, decrease it, given that even possible criminals seem to need a minimum level of illuminance in order to properly select their victims", Peña stresses. Neither the supporters nor the detractors of higher illuminance levels in order to increase citizen safety "have paid attention to an extremely important concept: public lighting installations users' perceived safety". In addition to professor Peña García, this research counted with the participation of Mª del Carmen Aguilar Luzón, professor at the department of Social Psychology at the UGR and an expert in Environmental Psychology; and Antonio Hurtado González, industrial engineer at Granada City Council and member of Luminotecnia para la Seguridad y la Sostenibilidad (lighting technology for safety and sustainability) research group, under professor Antonio Peña's management.